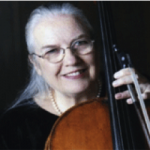 Janet Kriner graduated from the Philadelphia Conservatory of Music in 1957 and moved to Tidewater shortly thereafter to play with the Feldman String Quartet. She has taught Music History at Hampton Institute, held positions of lecturer and Associate Professor of Cello at William and Mary, ODU, NSU and the Governor MagnetSchool. She joined the Virginia Symphony in 1965 and has been performing for Young Audiences of Virginia since 1957. She has served as Principal cellist with the Virginia Opera and Co-Principal with the Virginia Symphony. She was a soloist with the Virginia Beach Orchestra, the Virginia Symphony and the Bay Youth Orchestra in Norfolk as well as Edinburgh, Scotland.